MANILA, Philippines — The economy continued its growth streak of at least six percent for the 14th consecutive quarter but failed to keep up with market expectations, growing by 6.1 percent in the third quarter this year. 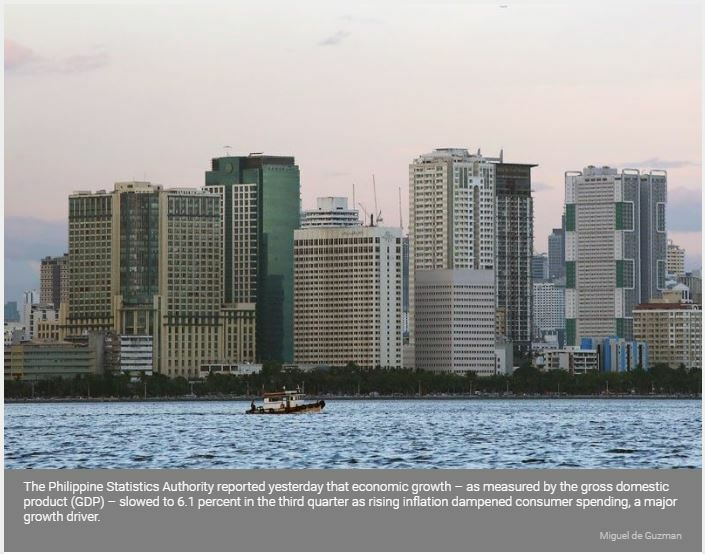 The Philippine Statistics Authority reported yesterday that economic growth – as measured by the gross domestic product (GDP) – slowed to 6.1 percent in the third quarter as rising inflation dampened consumer spending, a major growth driver. By comparison, GDP grew by a revised 6.2 percent in the second quarter and expanded by 7.2 percent in the third quarter last year. The third quarter performance was also the slowest since the six percent growth in the second quarter of 2015. As the government targets GDP growth to range between 6.5 percent to 6.9 percent for 2018, the domestic economy needs to expand by at least seven percent in the fourth quarter to meet the lower end of the target. Despite the slowdown, Socioeconomic Planning Secretary Ernesto Pernia said the third quarter performance puts the economy “on a higher growth trajectory” as it has been growing by at least six percent for 14 consecutive quarters. Had it not been for inflationary pressures, the country could have realized a GDP growth of between 6.5 percent to seven percent during the quarter, he said. Still, the Philippines remains among the fastest-growing economies in Asia, next to Vietnam which registered growth of seven percent and China, which booked a 6.5 percent growth during the quarter. “We are not exactly exuberant about the 6.1 percent growth rate, but still comforted that we remain one of the fastest-growing economies in Asia,” Perniasaid in a briefing yesterday. The slower growth in the third quarter was primarily attributed to the weaker household consumption during the period, particularly on food and other basic products. Household expenditure grew slower at 5.2 percent in the third quarter from 5.9 percent in the second quarter and 5.4 percent in the same period in 2017. This was the slowest since the third quarter of 2014 when growth in consumer spending was recorded likewise at five percent. Headline inflation spiked to 6.7 percent in September before stabilizing in October, fuelled by strong growth in food prices that made up half of the consumer price index. Since then, the government has enforced several non-tariff measures to increase the supply of key foodstuff and curb the growth of consumer prices. These cover the removal of administrative and non-tariff barriers on the importation of key food items such as rice, fish, sugar, meat and vegetables as well as the immediate release of rice stocks from warehouses of the National Food Authority (NFA). This was combined with a series of policy rate hikes by the Bangko Sentral ng Pilipinas to prevent second round inflationary effects. Pernia said the lingering problem in food supply can be traced to the outdated legal framework for agricultural development and trade, particularly the protectionist policies for rice and sugar. Some of the these legal frameworks, which are already four decades old, have not resulted in agricultural development that can support a growing population and an advancing economy, he noted. “With the measures we have been pushing for, the slowdown in household spending is deemed to be abatable and temporary. But we can only do so much. We need the support of many stakeholders here, especially the legislature,” said Pernia. NEDA thus reiterated its call to Congress to immediately pass the rice tariffication bill which would help reduce rice prices by as much as P7 per kilogram and raise funds for productivity programs for Filipino rice farmers. “We also reiterate our position to be more flexible as to the agricultural development program to be funded from the tariff revenues.� Conditions, as well as the needs, of the sector are bound to change.� To be effective, the program needs to be responsive and flexible,” said Pernia. On the demand side, robust growth was seen in government spending, private construction and investment in capital formation. On the supply side, the agriculture sector continues to be the laggard among three major industry groups, contributing a mere 0.03 percent to the third quarter GDP. This as the farm sector declined 0.4 percent in the third quarter from a growth of 2.6 percent in the same period last year because of successive typhoons that dumped excessive rainfall, delaying the planting decisions of farmers. “But what this also demonstrates is the vulnerability of the sector to weather conditions, which have been the norm,” said Pernia. The industry sector, which contributed 2.1 percent to GDP, also grew slower by 6.2 percent in the third quarter compared with the growth of 8.1 percent in the same period last year as firms grapple with rising prices of inputs and the weaker food demand by households. Food manufacturing was adversely affected by the output decline in the agricultural sector, the increase in the price of sugar and tin cans. The services sector, which had a contribution of 4.1 percent to GDP, remained as the main driver of the economy. The growth, however, was also slower at 6.9 percent in the third quarter of 2018 compared with 7.3 percent growth in the same period last year. Pernia said the resumption of tourism activities in Boracay would boost the growth of services over the medium term. The closure of the island covered the third quarter of the year, during which, tourism activities were not diverted to alternative destinations. Domestic demand is expected to strengthen again in the fourth quarter because of the holiday season, he said, noting pressures on food prices would continue to be addressed. This is expected to increase the capacity and competitiveness of firms as well as strengthen their linkages into domestic and global value chains. As inflation is the primary culprit for weakening demand, Pernia said the government would have to tread carefully on managing the growth in consumer prices and the need to sustain the growth of the economy. The BSP is widely expected to implement another rate hike before the end of the year in an effort to manage inflationary pressures. Reynaldo Cancio, director of the national policy and planning office of the National Economic and Development Authority (NEDA), noted that rising interest rates tends to have an effect on the growth in� loans from commercial and universal banks, therefore affecting consumption and investment. Pernia said that as inflationary pressures continue to linger, the focus now should be on stabilizing food supply through importation. “Inflation is an immediate and short-term concern. So to be able to address that, I think what we should depend more on is easing importation rather than expect the agriculture to perform better in the fourth quarter,” he said. “The easing of importation of rice, fish and other commodities consumed especially by poor households, that should be addressed more immediately rather than waiting for agriculture to perform better,” he said. At the same time, he said, monetary policy should continue to be supportive of growth. “If we can stabilize inflation, that can have a positive effect on growth rate,” he said. “We would like to be supportive of what the central bank says although usually what the central bank does is supportive of our growth targets,” he added.